This post goes out to Dan or any others that have researched the relationship of polyunsaturated fats and cancer. My question relates to which polyunsaturated fats are you referring to? Do you have a good & bad list or something to that effect? I think I recall Dan mentioning before that it was specific to Omega-6's and not Polyunsaturated Omega-3's like fish oil. I believe there may be a study or two out there saying that even poly Omega-3's are potentially bad via the potential to increase risk of metastasis of existing tumors. It had somethin to do with making the lining of tissues a more 'sticky' landing spot for circulating cancer cells. My first diagnosed BCC came at 29. It was also about 8 months after beginning meaningful supplementation with EFA's (both Fish Oil and Flax Seed Oil). I have wondered for several years now if there was any connection between these two items. The poly 3's have a powerful anti-inflammatory effect on me, as was evidenced by complete remission of all acne I had. But is this anti-inflammatory effect strong enough to blunt the strength of immune responses? That was long-winded way of saying which compounds should one avoid, limit, and balance with others? I have spent a long time trying to put together a diet with the right balance of fats, but I don't think I am there yet. I am sure there are some no-no's in my current list. The question is, have you eliminated SUGAR and various forms of SUGAR (like too much fruit)? It seems to me that no matter what else you put in or take out of your diet, this is # 1. Thoughts, anyone? Polyunsaturated fatty acids come mostly from omega-6 (linoleic acid) and omega-3 sources. Omega-6 and omega-3 are precursors to eicosanoids, a class of signaling molecules. Eicosanoids are either omega-6-derived or omega-3-derived. Omega-6 and omega-3 compete for the enzymes that convert polyunsaturated fatty acids into eicosanoids. 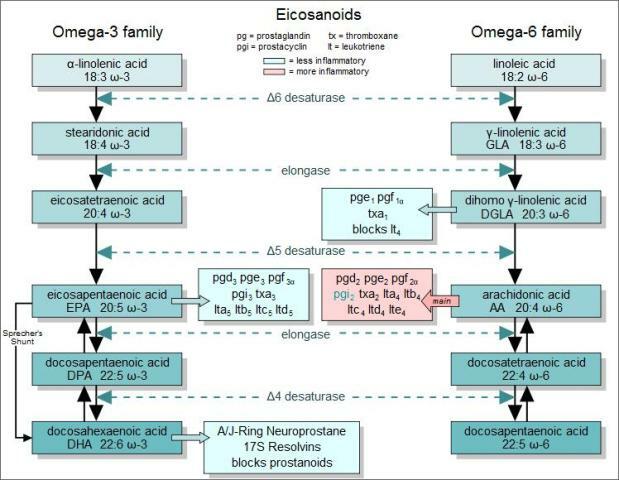 The ratio of omega-6 to omega-3 in tissues is related to the ratio in the diet and determines the ratio of omega-6 derived eicosanoids to omega-3 derived eicosanoids. Omega six fatty acids in the correct proportions are essential to life. Omega-6 derived eicosanoids are very potent and play a necessary central role in inflammation, but an excess of them is undesirable. Omega-3 eicosanoids are generally less potent, less inflammatory, and tend to participate in long-term repair processes. Therefore, the ratio of omega-6 to omega-3 in the diet will determine the potency and quality of eicosanoid signaling, which will determine an animal's susceptibility to various disorders dependent on inflammation such as arthritis, cardiovascular disease, and cancer. Most of our information regarding skin cancer and dietary fat comes from studies involving mice. Omega-6 in the diets of mice combined with UV light causes skin cancers proportional to the levels of omega-6. Mice eating margarine developed significantly more skin tumors when they were exposed to UV light or a combination of UV and a topical carcinogen than mice fed the same amount of butter. Intake of omega 6 is manifested in epidermal lipid peroxidation, thought to be another contributor to cancer. Omega 6 linoleic acid suppresses the immune system's cancer-fighting ability, and the effect may be more pronounced for skin cancers because of the damaging effects of UV light on omega 6 saturated skin. On the other hand, omega-3 fish oil, even in large amounts, protects against skin cancer in the hairless mouse. In another study, fish oil protected against skin cancer and doubled the amount of time researchers had to expose the mice to UV light to cause sunburn. The amount of linoleic acid in the diet as well as the balance between omega-6 and omega-3 determine the susceptibility of the skin to damage from UV rays. Here is the linoleic (omega-6) content of various oils. I would try to avoid anything not at the bottom of this list. In regards to thanks01's sugar concern, the combination of excess omega 6 and excess blood sugar levels is thought to be synergistically harmful. I think three important things to limit in the diet are sugar (fructose is more harmful than glucose), vegetable oils at the top of the list above, and white flour. That is great information Dan, thank you for taking the time to write it out. As to limiting sugar, I didn't raise that point because it is a base assumption for me... but is surely a point I strongly agree with. I am forced to follow that rule anyway due to my proclivity to fungal skin infections as mentioned in other threads. As to the details of your post, are you saying that not all poly-unsaturates (3's vs. 6's) are equal relative to poential skin cancer danger? In other words, should I care about the amount of polysunsaterates I get in the form of Omega 3's? Also, how do the Omega-6 linoleic and linolenic acids compare? I ask because I take a supplement that has Gamma-Linolenic Acid in it, which is a 6... but supposedly behaves differently en vivo than most 6's. Right, the mouse evidence says omega 3's are good for skin cancer in any amount, at least in regards to skin cancer prevention. However, excess omega 3s can suppress immunity, so I would not go too crazy. "Interestingly, not all omega-6 fatty acids behave the same. Linoleic acid (not to be confused with alpha-linolenic acid, which is in the omega-3 family) and arachidonic acid (AA) tend to be unhealthy because they promote inflammation, thereby increasing the risk of the diseases mentioned when consumed in excess. In contrast, GLA may actually reduce inflammation. Much of the GLA taken from the oils mentioned or as a supplement is not converted to AA, but rather to DGLA. DGLA competes with AA and prevents the negative inflammatory effects that AA would otherwise cause in the body. Having adequate amounts of certain nutrients in the body (including magnesium, zinc, and vitamins C, B3, and B6) helps to promote the conversion of GLA to DGLA rather than AA." Hmmm, I wonder if the chart is accurate because it looks like GLA cannot directly convert to AA. DGLA would not compete with AA, instead it would be a stepping stone to AA. More digging required, I guess. Dietary linoleic acid (LA, 18:2 omega-6) is inflammatory. In the body, LA is desaturated to form GLA (18:3 omega-6), yet dietary GLA is anti-inflammatory. Some observations partially explain this paradox: LA competes with alpha-linolenic acid, (ALA, 18:3 omega-3) for delta6-desaturase, and thereby eventually inhibits formation of anti-inflammatory EPA (20:5 omega-3). In contrast, GLA does not compete for delta6-desaturase. GLA's elongation product DGLA (20:3 #969;-6) competes with 20:4 omega-3 for the delta5-desaturase, and it might be expected that this would make GLA inflammatory, but it is not, perhaps because this step isn't rate-determining. delta6-desaturase does appear to be the rate-limiting step; 20:4 omega-3 does not significantly accumulate in bodily lipids. DGLA inhibits inflammation through both competitive inhibition and direct counteraction (see above.) Dietary GLA leads to sharply increased DGLA in the white blood cells' membranes, where LA does not. This may reflect white blood cells' lack of desaturase. Supplementing dietary GLA increases serum DGLA without increasing serum AA. It is likely that some dietary GLA eventually forms AA and contributes to inflammation. Animal studies indicate the effect is small. The empirical observation of GLA's actual effects argues that DGLA's anti-inflammatory effects dominate. Bottom line: GLA supplementation is probably OK, but I'll stick to omega 3 just to minimize the supplements I take. Luckily, you can make it easy (and more palatable) to get your GLA by taking Biotest's new FA3 supplement. The omega 6 pendulum seems to swing wildly at times. It is clear that omega 6's do some important things in the body. The implications of the types of fats (saturated, omega3, omega 6) has been studied a lot more for cardiovascular disease than cancer. It is a complex subject, but the key cardiovascular issue seems to be how much LDL cholesterol in the blood gets oxidized. http://wholehealthsource.blogspot.com/2009/09/animal-models-of-atherosclerosis-diet.html For cancer, the issue becomes inflammation. I think GLA is going to lead to lower LDL. http://www.drlam.com/opinion/essential_oils.asp At the same time I don't know what it does to the oxidation rate, so the net for cardiovascular is still a question mark. For cancer, GLA reduces inflammation and that is usually a good thing. The headline this week says to replace saturated fat with unsaturated fat for better heart health. It turns out to be junk science as far as I can tell. Just a reminder, polyunsaturated fats in the diet promote skin cancer. We don't have to choose between a healthy heart and healthy skin. Cut way back on omega 6 fats (industrial seed oils such as peanut, soy, corn, canola, safflower, sunflower), despite the results of the poorly performed new study and most likely the advice of your doctor. The title of the study is <u>Effects on Coronary Heart Disease of Increasing Polyunsaturated Fat in Place of Saturated Fat: A Systematic Review and Meta-Analysis of Randomized Controlled Trial</u> http://www.plosmedicine.org/article/info:doi%2F10.1371%2Fjournal.pmed.1000252 Take a look at the long list of excluded studies link near the bottom to begin to understand why this study of 8 studies had a predetermined outcome. Also, no distinction was made between unnatural hydrogenated (trans) and natural saturated fats. In terms of cancer, polyunsaturated fats (seed oils) increase risk, monounsaturated fats (macadamia nuts, olive oil) decrease risk, and saturated fats are neutral. I ran across an interesting graph about the Linoleic Acid (a polyunsaturated omega-6 fat) composition of body fat through the years from http://wholehealthsource.blogspot.com/2012/02/my-tedx-talk-american-diet-historical.html which I have pasted below. "Each dot represents an individual study spanning 1961 to 2008 (1, 2, 3, 4, 5, 6). The increase has been extraordinary and corresponds closely to the large increase in dietary linoleic acid." It lines up nicely with other plots concerning polyunsaturated fat consumption over the years. I know this is only speculation to link polyunsaturated fat consumption to the melanoma incidence chart below, but clearly the "experts" do not have a clue about the cause of melanoma as its incidence rise continues unabated. I personally believe all PUFA's should be avoided as much as possible . . . including fish oils. They oxidize very quickly at room temp. and even more rapidly at body temp. They are very unstable oils. Personally, my own experience with multiple skin cancers ceased when I stopped taking omega fish oils, flaxseed and consuming fatty fish such as salmon. I also added in k2 supplementation along with stopping the fish oils. I have not had a recurring lesion for over a year now.